Description of "Milk Cooperative Society in Tribal Area: A Financial Study"
This study was Conducted in Milk Producer Cooperative Society in Waroli Village in Valsad district to analyze the financial performance by using the data in Three years ( 2008-09 To 2010-11) annual audit reports of the financial statements Participatory discussion with management board team of Milk producer Cooperative society and interview with Manager, Accountant And shareholder’s. This Financial Project examines the financial health, Financial growth trends, And financial efficiency. The health check up financial growth trend conducted in the framework of most common financial ratios used in the study. financial data concludes that this tribal area Milk producer Cooperative Society Valsad District has healthy position on liquidity; has good Financial growth Every year. This society role model was kaprada talukas other same cooperative society. Graduated from B.com, Arts and Commerce College, Motapondha in South Gujrat University, Surat, Post Graduated from M.Com With Specialization of Financial Accountancy from Sir. K.P. College of Commerce, Surat in South Gujrat University Surat. Bachelor of Education (B.Ed.) from, College of Education Kharod, dist: Bharuch in South Gujarat University Surat. Research Area Interest: Commerce, Accountancy. 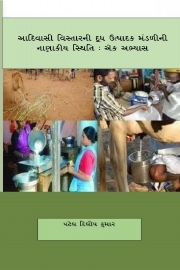 Reviews of "Milk Cooperative Society in Tribal Area: A Financial Study"